There’s nothing in the world like eating an animal that would, without hesitation or compunction, eat you. That goes double if it’s cooked in a rich sauce and stuffed inside a flaky pastry. 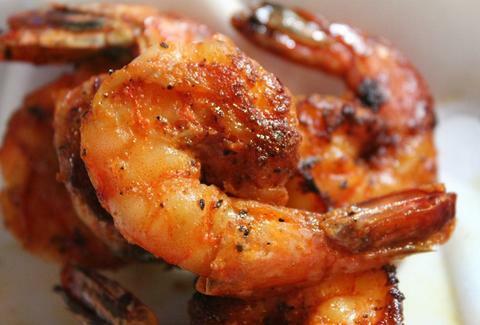 Louisiana food wouldn’t be Louisiana food without its African roots. (Note: Congo Square is one of the best stages at the Fest... and in New Orleans, for that matter.) 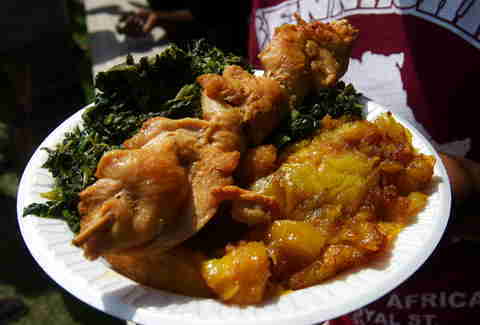 Bennachin’s awesome plate of poulet fricassee, jama jama, and fried plantains pays tasty homage to those flavors in a most excellent way. Also, you need at least ONE vegetable per day at Jazz Fest. 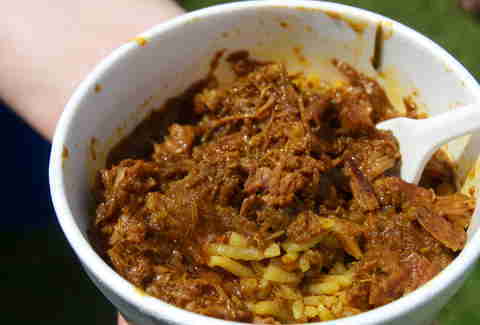 Pretty much everyone in NOLA knows that one of the best versions of cochon de lait (Cajun-style slow-smoked suckling pig) is at Jazz Fest, courtesy of the same folks behind Walker’s BBQ. There will be a line. It will be worth it. Pork rinds are for suckers. 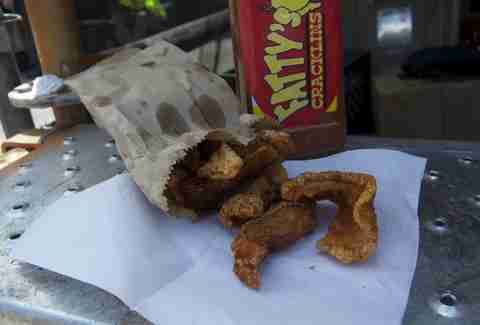 Cracklins -- deep-fried hog skin and fatback -- are for champions, and no one does them better than Cajun folk. Grab a sack, spice ‘em up, and leave the guilt on the back burner, where it damn well belongs. 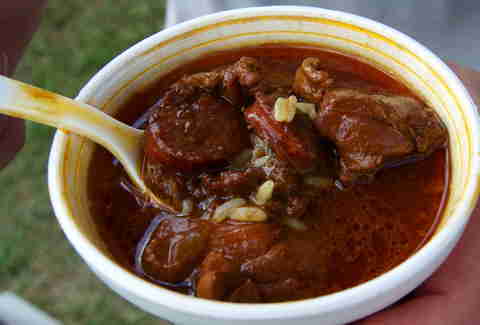 If you want mudbugs at Jazz Fest, forego the tiny plate of boiled crawfish and dig into the real deal. Vaucresson makes some of the best sausages in the area, and that says a lot, seeing as this is an area that’s deeply in love with sausages. 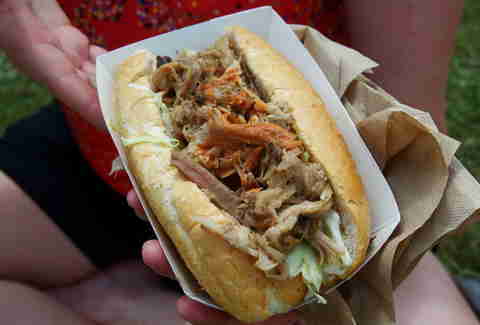 What’s more to say about one of the best sandwiches ever invented? 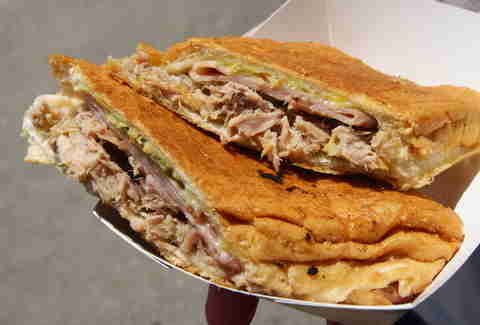 Hot pork, ham, pickles, and gooey melted cheese on pressed, toasted bread... it doesn’t matter whether it’s Louisiana or Havana, you know you want it, and this is the real deal. 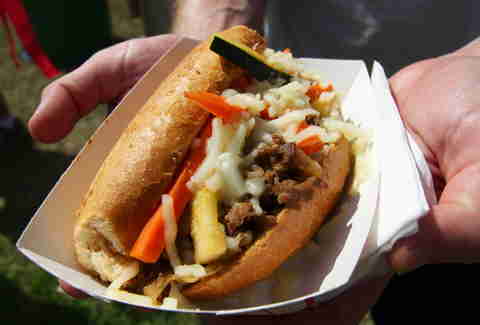 A newcomer to the Jazz Fest stable of food offerings, this Japanese version of BBQ beef on French bread with melted cheese and pickles quickly became a crowd favorite last year, and for good reason. 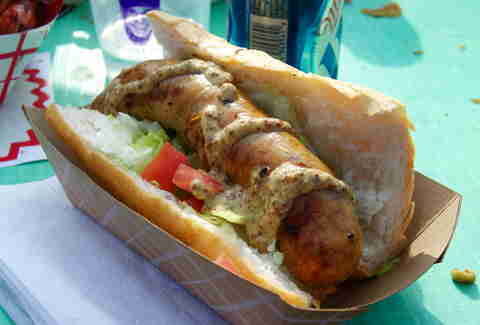 From one of the best, most underrated restaurants in NOLA comes some seriously fantastic Tunisian cuisine. 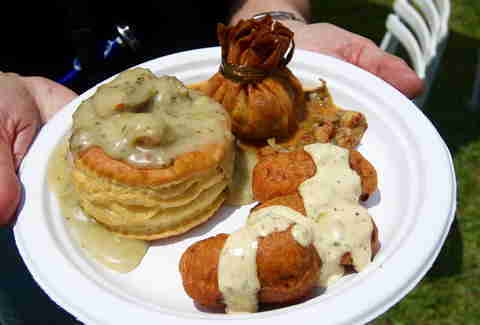 People literally wait all year in New Orleans for this single plate of food, a combination of oyster patty -- a savory French-style vol-au-vent pastry filled with oyster dressing -- crawfish beignets, and a crawfish “sack”, which is a crepe filled with crawfish stuffing, tied with a leek top, and deep fried. Yeah, it’s worth the wait. 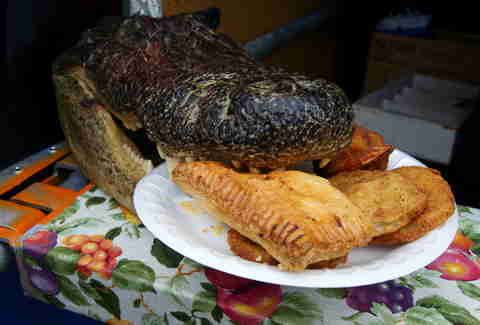 Based out of Lafayette, Prejean’s is known for two things: its amazing dark roux gumbo filled with game and sausage, and the fact that there’s a 14ft-long stuffed alligator in the lobby named “Big Al”. Run, don’t walk to their booth. 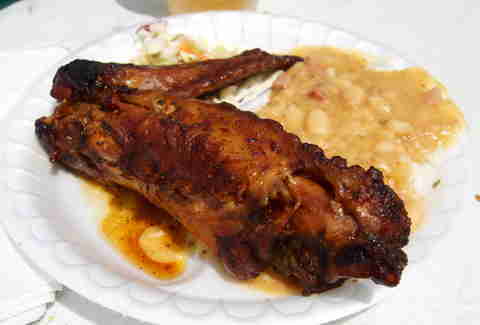 This is probably one of the most underlooked booths at Jazz Fest, but for real -- the turkey wing and side of thick, meaty beans will counteract any newfound vegan instincts you might develop by catching Phish's set. 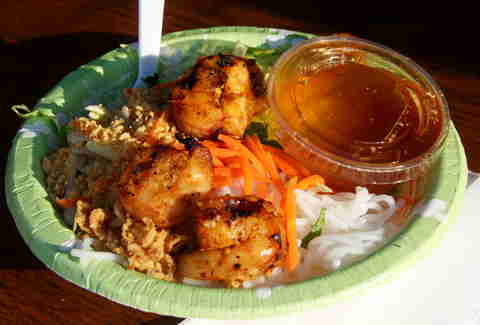 It wouldn’t be New Orleans without Vietnamese food, and Ba Mien offers a refreshing counterpoint to all the deep-fried festival fare with a killer plate of shrimp, vermicelli rice noodles, and veggies. Honorable mentions: Mango Freeze, Rose-mint iced tea, Natchitoches meat pie, Crawfish Monica, ice cream sandwiches, Cajun duck po-boy, boudin balls, yaka mein, crawfish bread. Oh, and BEER.